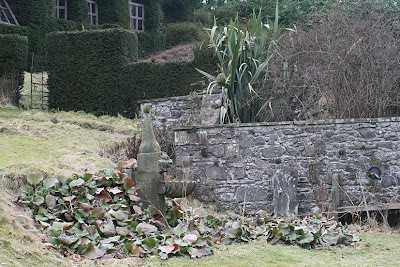 Not kept in secret, although hidden away, Fingask Castle did feel like a secret find yesterday. The promise of snowdrops drew us along some quiet back roads only a few minutes from a very busy dual carriage way that I have driven along so many times. 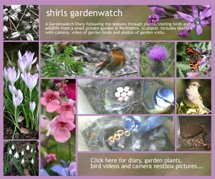 Since writing this gardenwatch blog I have been surprised at the activity going on in my garden that previously I have missed. It is also becoming clear I have been missing much outside my own garden too. 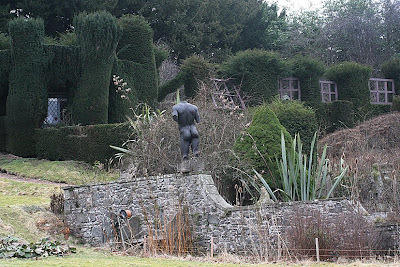 Topiary and statues I had expected to find at Fingask based on the description on the Scottish Snowdrop Festival website. With that in mind I had asked my Mum to join me on this trip to discover snowdrop displays. However, I had no idea the humour and charm we would also find there. What a setting this castle had. The red flowers of a rhododendron brought us from the lawn up to a shaded path behind it. 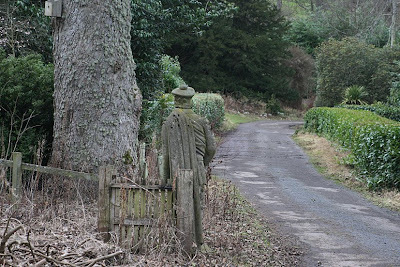 Sculptures at the end of this path drew as along it. What a wonderful focal point! 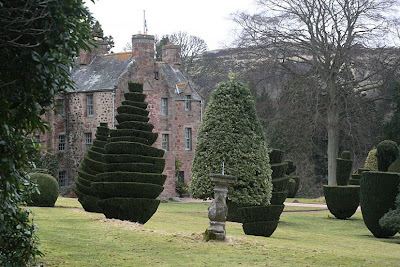 Fingask Castle has been bought by the Threipland family four times in the last 400 years! I wonder if they are responsible for adding the selection of sculptures and more unusual garden design features of this garden that we discovered as we walked around. Notice the window frames placed into the hedging. Looking to the plants, the river of bergenia coming down the grass banking and around a water feature caught my eye. We didn’t explore the garden behind the wall as it appeared to be a private area. Let’s have a closer look at this pair below… having a quiet drink on the terrace! The next statue tells quite a different story. I am guessing by the look on the faces of the family the man (husband/father most likely) is going away to work. Perhaps he will be away for some time. Our visit had absolutely no concept of time as we explored this magical place. Oh… but we were here to see snowdrops…..
A gentleman, not the one in the statue below, suggested we walked a particular route down the hill away from the castle to find the snowdrops. I am guessing by his attire, manner and voice he could have easily been the owner. He was with someone at the time so it wasn’t appropriate to ask him. 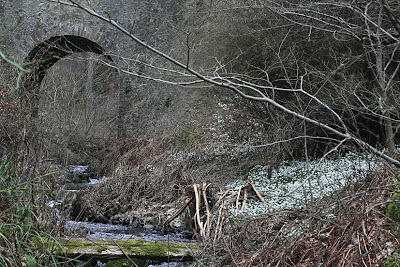 Below the road and under a bridge, making their own white streams and waterfalls, snowdrops brought life to this area. We followed narrow paths through dense shrub plantings. 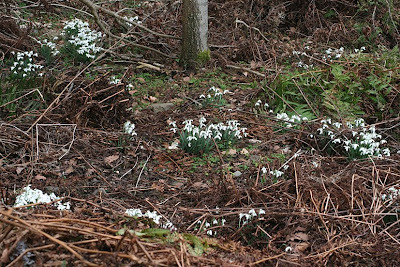 Scatterings of snowdrops were seen along the way. 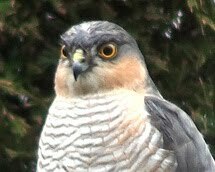 They were looking particularly beautiful on the wonderful browns of the ferns lying on the ground. Snowdrops are just so very pretty and elegant aren’t they? It was time to go and we headed for the car park admiring the view all the way out to the Tay Bridges before we left. However, I didn’t put my camera in my bag quite yet. I laid it on the back seat of the car knowing full well I would use it just once more! On our drive up we past a wonderful display along the roadside. 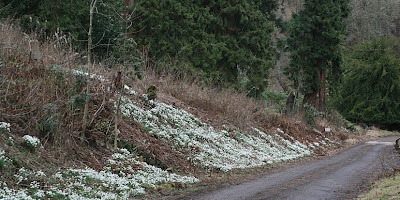 I stopped the car on the way down to capture our first and last images of the snowdrops at Fingask Castle. This weekend I hope to visit another quite different area with displays of Snowdrops so fingers crossed the weather will be fair. This year I am looking to see if any other area, within travelling distance, can beat the vast numbers of snowdrops I saw at Dalmeny last year. Now that woodland really does take your breath away! 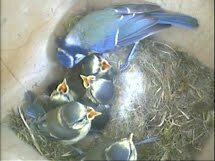 Meantime, I should give a quick recap on what’s been going on in my garden. Mm… I need to get out there a do some ‘real’ gardening. Things are moving on out there with crocuses now showing their lovely smiley faces when the sun comes out! Tulips are pushing their leaves through the ground and there are hellebore flower buds just about to open. Ah… the gardening year has well and truely started! All photos above were taken on February 24th, 2009. What a beautiful place! It looks so peaceful, the Snowdrops are gorgeous and I just love the sculpture. I had to smile at the bare bottom in the private area!! We unexpectedly came across a sculpture exhibition in a garden in Woodstock Oxfordshire a couple of years ago and it was stunning particularly as we just found it by chance. What an attractive garden. 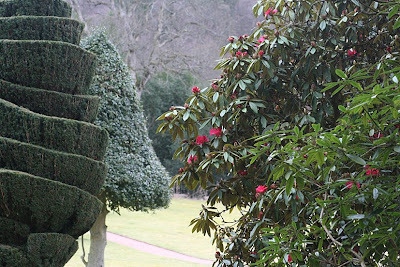 Loved the topiary which was very individual and rather humorous. 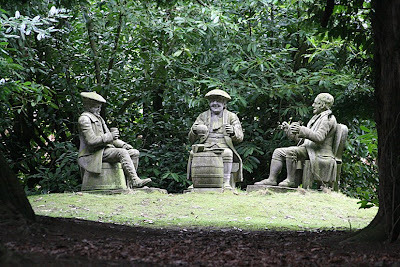 The statues were unusual too - like you say they each seemed to suggest a story. The snowdrops look like an patch of snow. Beautiful flowers! You visited a real treasure of a garden there. I love the statues. Thank you for sharing your day out. Hi Shirl, Thanks for such a treat--your tour was fabulous! And I didn't need to cross the ocean to see it!! Lovely photos Shirl, it looks like you had a wonderful time! Now that looks like a really magical place to while away some time Shirl :) I wish Scotland was a bit nearer ! What a fantastic gem of a place. The snowdrops look so beautiful, as do the sculptures and look a bit querky too. The castle looked amazing too. Glad you enjoyed your visit. I don't think I have seen anywhere quite like it before. Have a good time snowdrop-searching again this weekend! Hi Shirl, I just stopped by for a peek & lost track of time. Enjoyed the garden tour, particularly the Snowdrops & statues. P.S. 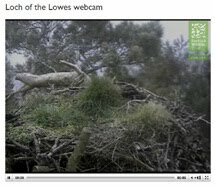 The previous post with pic of Loch Lowes brought back some memories of a visit many years ago when the Ospreys were in residence. Shirl, what a perfectly wonderful place to explore. 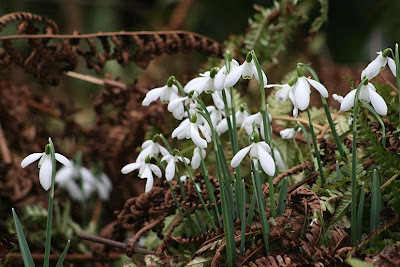 I do not have any snowdrops in my garden, something I had better rectify. What an unusual treasure. Thanks for sharing, Shirl. Oh my, that carpet of snowdrops looks like snow itself! That would surely be one of those things that makes you draw your breath in sharply -- magical! I've never seen so many snowdrops in one place! Wonderful Blog. I really enjoyed your pictures. I enjoy old mature gardens. Good job! Thanks for faving my blog. I will be back. Well, that was a secret and a half. Such a beautiful garden and castle and vast drifts of snowdrops too. What more could we possibly ask for. BTW saw Edinburgh on Flog It yesterday and it brought back some great memories! Normally, I should dislike this overabundance of statues... But indeed, they give the place a certain magic, and you can't dislike them. And those snowdrops... unbelievable too! 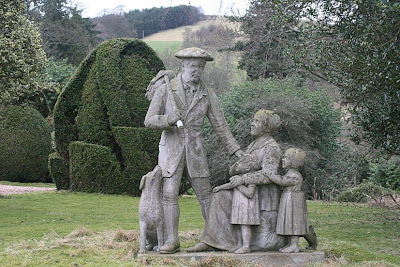 Wow, all those statues and the snowdrops! They match so well, bit of magic in this post, Shirl! What a trip to Fairyland and back! This looks like a nice place to tour and take pictures! Looks like a most excellent place to spend a day Shirl. Thanks so much for sharing your trip with us! I loved the topiary and the statues too! A patch of snowdrops like those put my little groups to shame. I am going to think BIG next fall! But where shall I put them? Loved the fanciful characters in this garden. The owner must surely have a good sense of humor. It is awesome! 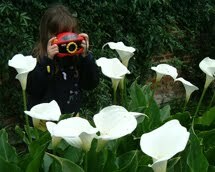 I love your pictures as they capture the true feeling of this garden. I wish I could visit it in person. I do hope you find lots of snowdrops this weekend. 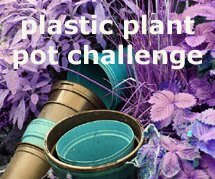 After seeing them on all the blogs I have promised myself I will be sure to plant them this fall. Have a great weekend. Oh, my, what a magical place! This is definitely going on the list of places we have to visit when we go to Scotland. (I don't know when that will be, but I hope our kids will still be kids.) The Snowdrops are just an added bonus. Shirl - what a treat to see this through your eyes. 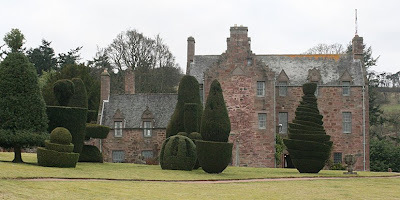 I quite liked the topiary, and the garden statues were great - but the windows in the hedge! awesome. Some wonderful sculptures of human-sized humans there Shirl. And I've never seen so many snowdrops growing together like that before. Beautiful. What a wonderful tour that was! I've always wanted to see Scotland and this may be as close as I get. What a delightful tour Shirl. The snowdrops were worth the walk. They are just beautiful in masse. 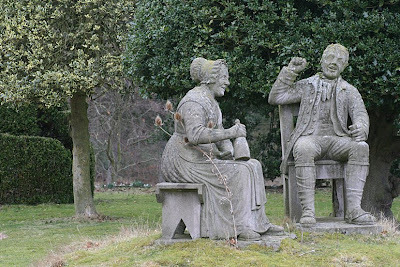 I love the statues in the garden too. I wonder if they come alive at certain times of the year?? 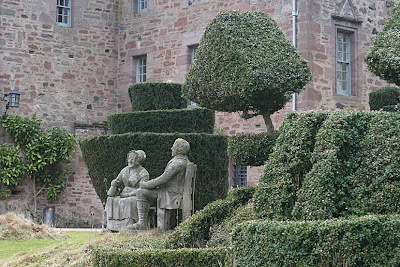 wow, what great topiary! as soon as it warms up, i'm wielding the shears on my yew dragon! 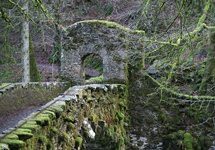 thanks for the wonderful photos of a magical place. Just bumped into your blog, good to see someone else championing scottish gardens. LOL… yes there are quite a few language differences aren’t they. I always think of them when I write – most especially with the word ‘colour’ which I probably use and see the most.